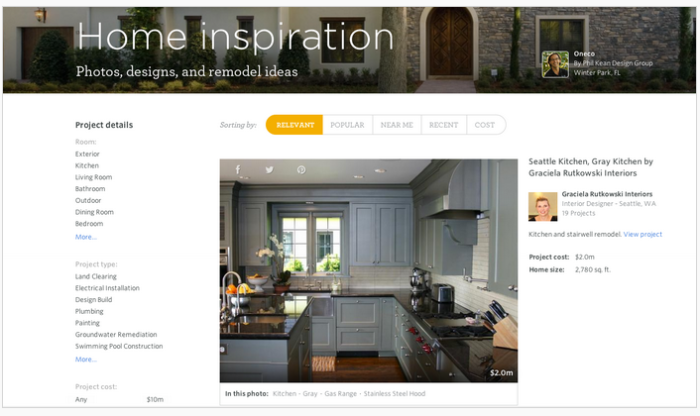 GR Interiors featured on TechCrunch! Social media has become a critical platform for consumers to share comments, read reviews, and discover local businesses in their area for virtually any type of service. In the home improvement world, Porch has become a staple for finding and sharing information about service professionals. Porch is a fast-growing home improvement network that includes over 1.5 million professionals throughout 250 categories, in order to pair your project with the right service provider. A recent article about Porch in TechCrunch featured Graciela Rutkowski Interiors! The TechCrunch story includes a photo of the GR Interiors Porch profile. It shows one of our modern, sleek Seattle kitchen designs. Each business can upload photos of projects to their profile page so that users can get a sense of style and aesthetic. Our Porch page features 20 projects with photos—including Pilar Room Nursery, Ward Home, Twins Room, Lake Home, Seattle Bathroom, and many more. Visitors can also see typical project costs, home values serviced, user reviews, and other business information. Click here to check out the Graciela Rutkowski Interiors profile on Porch. Another great feature that Porch provides is an interactive map of each featured project. You can see on a map of the Seattle area where each GR Interiors project is located, then click to enlarge a photo of the design. For more information and a photo gallery of GR Interiors project, visit our complete portfolio. Thank you TechCrunch for featuring us in your article and Porch for providing a valuable tool for home improvement professionals and customers to connect! Consider Graciela Rutkowski Interiors and Home for your next interior design project. Our award-winning, full-service design studio is located in the University District of Seattle. We provide an excellent customer service experience combined with high-quality, sophisticated style for your space. Contact us to get started! Posted on September 13, 2014 by graciela in Featured, Interior Design, Press and tagged GR Interiors, Porch by graciela. Bookmark the permalink.